Police are searching for a suspect who set a car on fire in the driveway of an East York home on Friday. 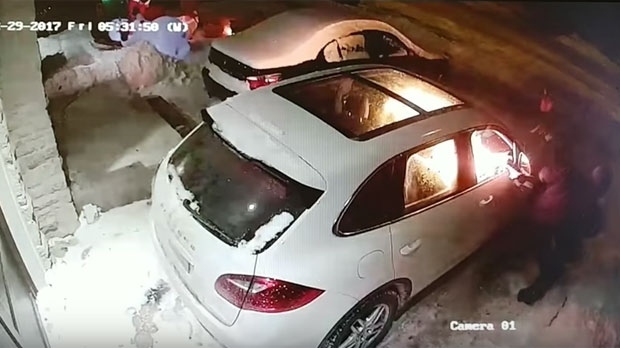 At around 5:15 a.m. on Dec. 29, a man walked up to a Porsche parked in the laneway of a home near O’Connor Drive and St. Clair Avenue East and smashed the window. Police say the man then doused the vehicle in gasoline and set it on fire. He was last seen fleeing the area in a white four-door sedan. A detailed suspect description has not been released but he was believed to be wearing a dark jacket, gloves and black boots. Investigators say they are concerned that the suspect may have suffered serious injuries following the incident. Security camera video has now been released and police are asking anyone with information to contact 55 Division or Crime Stoppers.